I've recently purchased the NGS kit no. 18, LMS twin pack of wagons. This is what is in the packaging. The query is, that the instructions state that there's FOUR sprues. Only there's only TWO sprues in the packaging. Has anyone got any experience of these kits. I think your missing two as the sides and ends are different on each you've got so you could only build one van not the pair you should be able to. I would contact the shop. If your picture is of one Kit 18, then with the Peco sprues you've a total of four sprues for two vans. It looks correct; although it is a kit for two vans, you can't make a pair of identical vans, but one each of three choices. Four sides for two different vans; six ends for choice of pairing; two roofs. It's good to see that I'm not the only one to interpret this situation in a couple of ways. I've banged off an email to the NGS shop, complete with pic, I'll keep you posted. To quote the NGS Handbook aka RTFM - "Each kit will allow the construction of one 9ft wheelbase and one 10ft wheelbase van . . plus the 9ft version is provided with two types of end . . . "
You have all the parts needed to complete 2 vans and that's what the kit says it will make. I agree though, the instructions are not particularly great. If you buy 2 kits (as I did) then you can make 2 vans the same plus another 2 vans. My vans - currently these are sat in the spray booth whilst the paint dries. Then they come back to my workbench for finishing off and decaling. Then back to the spray booth for a matt coat to seal it all in. Since you mention decaling, where did you source you decals? As per CliveH and Scottish Modeller; you have all the parts needed to build two vans (1 of each). My decals came from Modelmaster (other decal suppliers are available). I know from experience that the instructions aren't the best so read carefully as there are three van ends but two apply to only one of the vans. Otherwise they build up into nice kits. As per comments already - Modelmaster Decals, bought when he was selling NGS decals with agreement of NGS. But - a quick check on the shop and are available to NGS members - in stock as well! 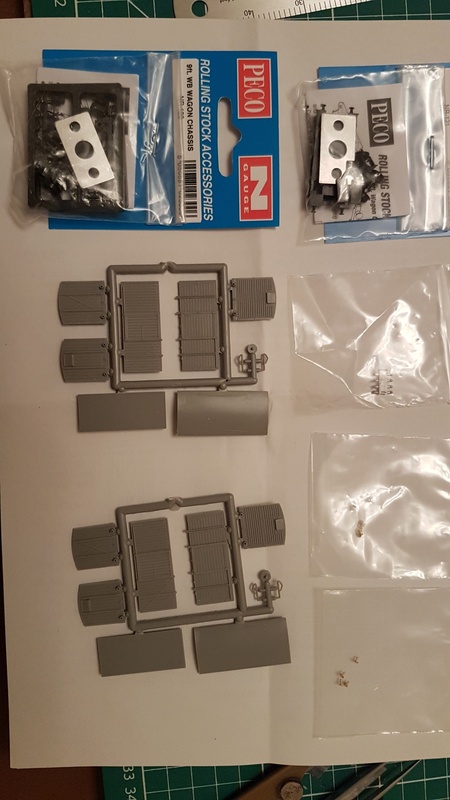 I've had a response from Adrian at the NGS shop and he's confirmed what I suspected, the instructions are incorrect in that it should be TWO sprues not FOUR as stated in the instructions. A very prompt response I thought. On the decal subject I was being a bit dense, I've already got the decals, the ones mentioned previously, bought at the same time as the kit!